[BB-Blog]: Rizzo's Original Fortune Teller. This looks like a fun hostess/party gift. 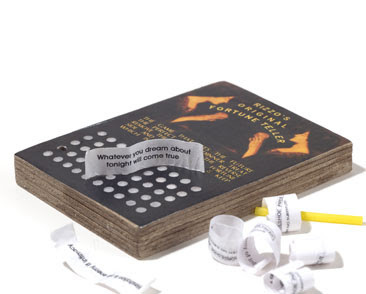 Small cardboard game board with 50 sealed holes, each containing a rolled up-paper fortune. Push through the fortune of your choice using the included plastic pin. Choose carefully -- all fortunes guaranteed 100% accurate. 2.5" x 3.5" x .5".